Air Conditioning Repair Hillsborough County: Your HVAC Issues: Repair or Replace? Your HVAC Unit Issues: Repair or Replace? Living in the Tampa area, we get used to a certain climate. Though our winter months tend to get quite chilly, Florida summers are anything but mild. With high temperatures and high humidity, the hottest days of summer make us feel like we’re melting, and our outside activities are pretty much limited to water-related fun. We rely so heavily on our air conditioning that if someone were to tell you that their Hillsborough County home didn’t have AC, you’d definitely be incredulous. We love our air conditioning! Though you might not remember how much you rely on your cool temperature setting during these cold months, when summer comes back around, you’ll once again get a taste of what it’s like. You and your family count on your HVAC unit to be consistent and functional so that you can maintain comfort in your home. But what happens when, for whatever reason, your AC stops working? We know that there are worse things that could probably happen, but in the middle of a hot and humid Florida summer, we’d be suffering without AC. There are many reasons why your unit might stop doing what it’s supposed to do. Especially if your HVAC unit is older, it can start showing signs of wear and tear. When your faithful and trusted cooling unit communicates to you that it needs some TLC, you could start to notice a change in airflow, a change in air coolness, your unit’s continuous running, or sporadic turning on and off. If you start to notice differences in your HVAC’s behavior or the quality of the air that it puts out, you might need to call your local AC repair professional. Benjamin Brothers will come out, diagnose the problem, and present you with your solution so that you can get back to your comfortable life of coolness. In this two-part blog, we’re going to talk about some of the most common problems to befall your HVAC unit and whether the problem requires a repair or a replacement. Most people don’t realize the extent of what their HVAC unit does for their home. Not only does your HVAC system distribute the right temperature of air throughout your entire home, it also ensures that the air you’re breathing is clean and free of dust and allergens. You are breathing this clean air because your unit has filters. However, as these filters start to get dirty or even clogged, you’ll start to notice a change in air quality. If you do notice this change, call your local HVAC or AC service pro. Repair: Since the problem is just a dirty filter, your unit probably doesn’t need to be replaced, unless, of course, you’re also dealing with other HVAC issues. Your solution is probably as simple as your AC technician replacing your HVAC filter. 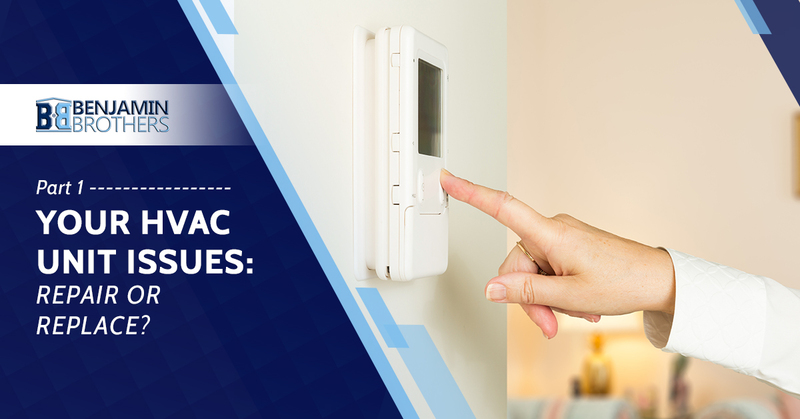 If you’ve noticed that your house isn’t maintaining the temperature that you’re setting your thermostat to, you’re probably assuming that there’s a problem with your HVAC unit. However, the issue might be with your thermostat. Diagnosing this problem will definitely require the help of your service pro, so make sure you give them a call when you start to notice issues. Repair: Since this issue has nothing to do with your actual unit, we’ll put this into the repair category because you’ll definitely want to get your thermostat looked at, and perhaps even replaced. When you start to feel warm air from your registers, the problem might be frozen or dirty coils. Several things can lead to frozen coils; if you have a block in your condensate lines, moisture that needs to flow out of your unit will become trapped. Another reason for frozen coils is a dirty filter or broken fan; both of these will hinder the cold air from moving out of the unit. If your problem is excess dirt on your coils, this may be the result of an overaccumulation of dust in your unit because of a dirty filter, broken fan, or lack of regular maintenance. Repair: Now, we’re not saying that your coils will never stop working on their own. When that’s the case, you’ll definitely need to call your service pro right away so that other issues don’t result from your broken coils. But with frozen or dirty coils, the underlying problem for the improper function of your coils is caused by another factor, like an accumulation of dust or moisture. Whether your unit is only a few years old, or it’s going to a decade, it’s never too late to contact your service professional for your yearly maintenance. And if you’ve started to notice issues with your home’s air quality or temperature, give your professional AC repairman a call. Living with a unit that isn’t functioning the way that it’s supposed to can lead to further damage to your unit, poor air quality in your home, and higher utility bills. In part two of our blog series, we’ll discuss the HVAC problems that occur from a lack of regular maintenance, a refrigerant leak, or blocked and leaky ducts. Stay tuned for that portion so that you don’t miss any of our exciting HVAC system facts. Benjamin Brothers is proudly serving the Hillsborough County and Pasco County area and we’d love to hear from you. Give us a call or visit our website for a free estimate.